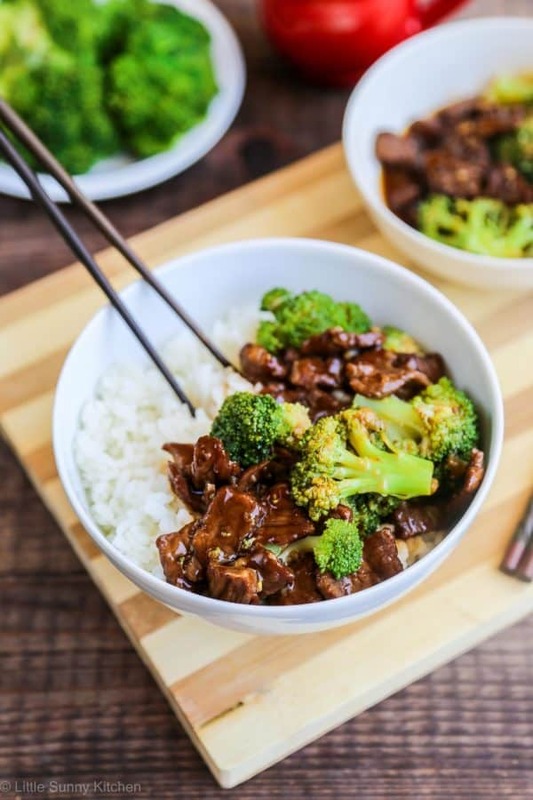 Easy Slow Cooker Beef and Broccoli – forget take-out! This is much better than any take out! This is actually my sister’s favourite dish. I also love it because it’s sooo easy to make, the kids are always happy to eat it, and it’s just SO delicious! I think that I love anything that is made in the slow cooker. I really like how tender the meat becomes, and how it requires very little effort to make. My favourite part about using a slow cooker is the fact that I can just put all of the ingredients in it in the morning, and then come back home from work to a lovely warm meal! I’m a full time blogger now, but I mean when I did have a job I used my slow cooker all the time, and still do because the food always turns out incredibly delish. The soya sauce gives this dish a distinctive taste, and so does the garlic. The sauce is homemade, and the tender beef slowly simmers in it to create an incredibly flavourful meal! It’s important to note that the broccoli should only be added in the last 30 minutes of cooking, as you don’t want overcooked broccoli. 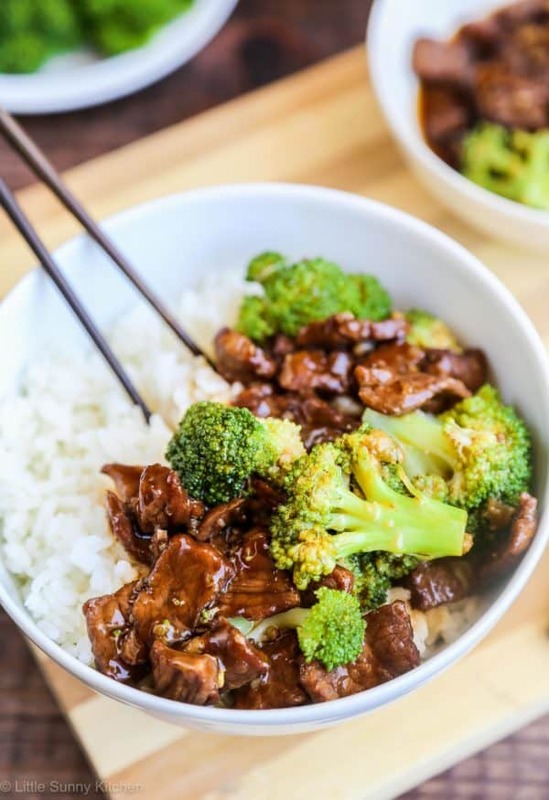 The beef and broccoli is usually served on a bed of beautiful white rice, and nothing can beat the taste! Now I have to be honest with you and tell you that if I’m in a rush I don’t eat my Chinese food with the chop sticks, but however you choose to eat this dish, it’s still extremely delicious. In the past couple of months I’ve been testing out my Redmond Sky Scales, a new product by Redmond which is basically much more than just a kitchen scales. These scales can give you the nutrition value of ingredients that you use to make your food. It’s a wonderful way to keep track of your calorie intake, and to give you an idea of what is actually in your food. Sometimes we seem to forget the calories, the fats and the sugars and we just enjoy our food without realising that we are consuming much more calories that our bodies need, or too much sugar for example. These scales have helped me control my calorie and sugar intake. They are quite easy to use, as you just need to download an app on your smartphone “Ready for sky“, log in and connect your phone with the scales. As you weigh your ingredients, the app shows you all info that you might need about the ingredient. For example calories, sugars, fats, vitamins…etc. The scales are also very accurate, as they are able to show up to 1 gram accuracy in the measuring unit that you would like “grams, pounds, ounces”. There is also a cool feature, which is a timer with signal that allows you to track cooking time. And the scales automatically shut down if left without using for 5 minutes, which is great as when I’m cooking I tend to forget these things. You can order your Sky Scales today by going on the Redmond website. Price is £41.90 and they come with a 2 years warranty. In a slow cooker, place all ingredients together (except for the broccoli, water and corn starch). Make sure that the sauce is covering the steak slices. Cover with lid and cook on low for 5 hours. In a mall bowl whisk the corn starch with water, add to the slow cooker along with the broccoli. Cook on low for 30 more minutes. Made this tonight and it was wonderful! A new go to dish for my family. I’m glad that you enjoyed the recipe. I also cooked it for dinner just a few days ago (on Sunday)! We some something similar with beef to put in tacos. It’s SO good. What a great idea! Never thought of Oriental food for a crockpot. I’ve not tried anything oriental in my slow cooker, or adding in ingredients at the end that require a shorter cooking time. Thanks for inspiring me to try both. 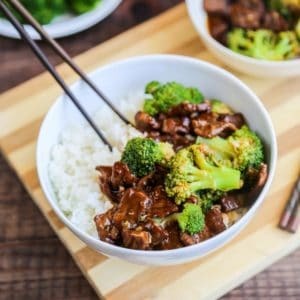 I love slow cooker Chinese dishes, and I add the broccoli at the end as I like it green and not overcooked! That is a nice scale! I like the accuracy and the calorie app – very good for keeping track of things. And the beef and broccoli is making me hungry. Slow cookers are the best for busy days. I love my Sky scales, a wonderful gadget! And the slow cooker is amazing for busy people that work during the day. The SkyScales are great. I love the Chinese sauce – it sounds soooooo good. Yes with the soya and the garlic yummmmm!